The Gose style has been around since the 1700’s and has experienced a bit of a resurrection of late with breweries in Leipzinger starting to make this style of beer again, including Gasthaus & Gosebrauerei Bayerischer Bahnhof. This style of beer is a wheat beer, Gose tends to be unfiltered, low hop profile, and makes use of spices such as coriander. Used the inverted bottle method to pour this beer. Ended with a inch of head. It is straw to amber in color. 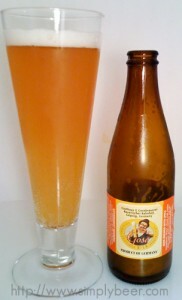 The beer is very cloudy, because it is an unfiltered wheat beer with huge chucks for sediment floating around. Initially had an inch of head which rapidly dissipated, but it does look fairly carbonated as I see co2 bubble popping on the surface. Had a very sharp fruity tartness, apple and yeast are the dominate aromas. No perceived hops which is characteristic of a Gose. This beer is exceptionally dry, highly carbonated. The carbonation of the beer really makes the beer expand in your mouth, coating the entire palette. The flavor is dominated by a tart citric apple with a slight undertone of peach. Was expecting a bit of spice or coriander, but that was not present. This is an interesting beer, there is some sweet in the beer that helps reign in some of the tartness. I felt it was a bit over carbonated at first, but by the end of the beer, it was fine. It had a mouth feel of a champagne, dry and bubbly. With an ABV of 4.6% it was very light and refreshing. When I was drinking this, all I wanted to go with it was a big soft salty pretzel. Had it on tap at Rustico in Alexandria, Va about a month ago. Great session beer. Crisp and lively, with a touch of fruitiness along with being a little tart and salty. Really enjoyed the couple of glasses I had.